3" Velour Pouches - pack of 100 - Black or Mixed. Select color below. 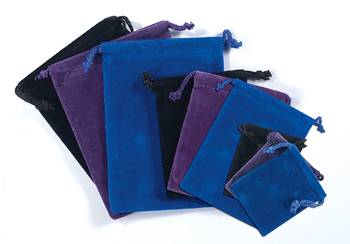 3" Velour Pouches - pack of 100. Choose from Black or Mixed. (Mixed pack contains blue, black, purple). Ideal for gift pouches, or packaging for jewelry, stones, hanging crystals. These are one of our most utilitarian and purchased pouches. A must for every store!